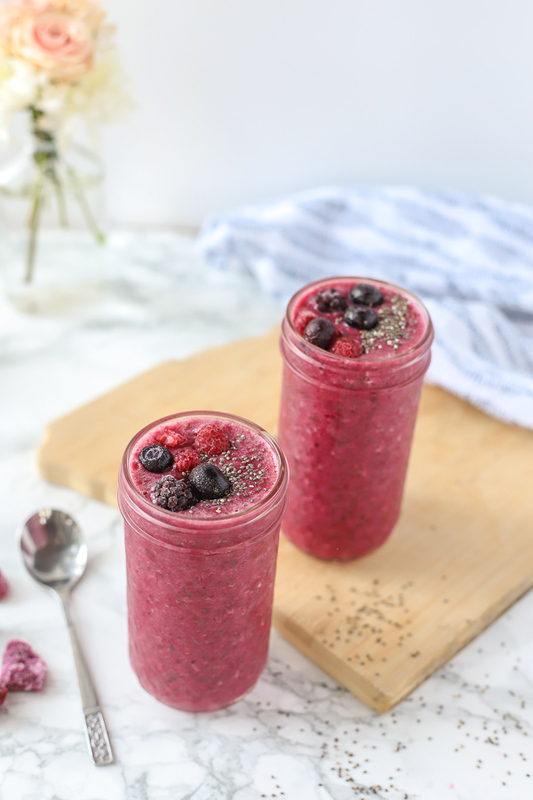 A delicious berry beet smoothie is packed with healthy ingredients and doesn’t taste like beets. 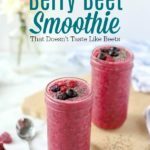 Berry beet smoothie recipe is packed full of hidden veggies and includes more ways to boost the nutrition. 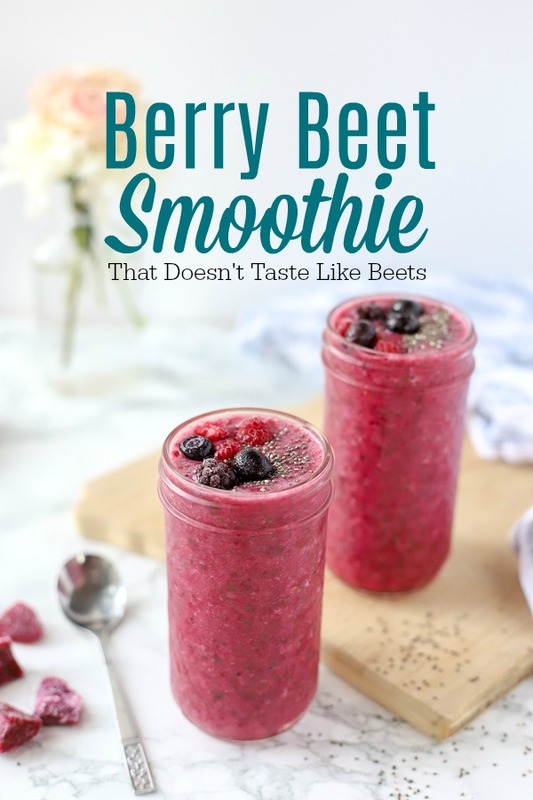 Follow my tips below to make this delicious recipe not taste like beets. Beets… nasty little dirt devils. Too far? I really wish I liked beets, but alas, I despise them. They literally taste like dirt to me no matter how they are prepared. That was until I started throwing them into beet smoothies and worked real hard to cover up that taste. And I would say I have successfully made beets tasty. I know what you’re thinking… “Amy if you hate beets so much why are you eating them?” Great question. Beets are so healthy and love to be able to add in super healthy foods even if I don’t like them. Really, just a nutritional purpose. They are packed with vitamins (like folate), minerals, fiber and have anti-inflammatory properties. Even if they do taste like dirt, I can’t deny how healthy they are.. dang it. So sneaking them into smoothies will have to do. I love making super healthy smoothies taste awesome. Pack them with veggies and the kids don’t know. Well they do cause I tell them. My kids LOVE healthy foods and LOVE vegetables. Maybe one day I’ll share how we got them to love all types of foods. But still, I love sneaking in healthy foods for the extra nutrition. Can you ever eat too healthy? Doubt it. Maybe this will make up for the fact we had some cookies today… just kidding it doesn’t work like that. Another great way to eat beets is in brownies. Sounds strange, but my friend made some collagen beet brownies and they were so good. Use liquid of choice. You could use milk, coconut milk, water, or juice. If you use a less sweet liquid, you may want to add honey or maple syrup. If you use juice you can omit any added sweetner. Use frozen fruit. This makes it more nutritionally dense instead of using ice to make it cold. Add in extras to boost nutrition like a tbs of collagen, chia seeds, some nut butter, or a scoop of full fat yogurt. Blender (I have this cheap and effective one) and measuring cups. Nothing too fancy. 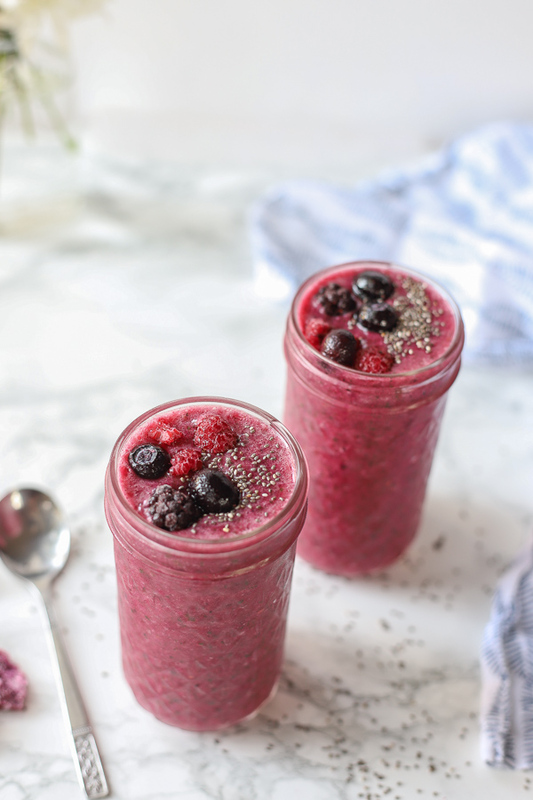 In a blender, add in frozen mixed berries, beets, banana, and frozen pineapple. Pour in liquid and add any extras you may want. Can I freeze beets for smoothies? Ohh yea. I actually prefer frozen beets and just buy them from the freezer section. Yes. You can eat them in salads, smoothies, pickled, with bread. How ever your heart desires. If you love them raw go for it. The only way you would catch me eating them raw is possibly pickled or in this smoothie. Love healthy drinks? Check out some of our favorites! Homemade monkey milk is a sweet and chocolately drink your kids and adults will love. 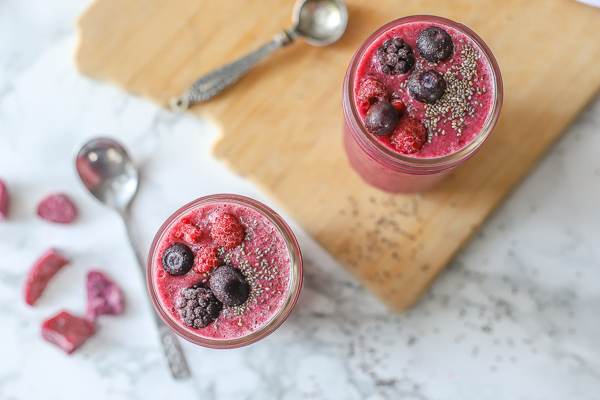 Kombucha Peach Smoothie is a delicious smoothie made with a fizzy and fruity twist. Nutrition facts are based on using water. If you count calories you will want to adjust it based on what liquid you use. Do you love or hate beets?